This spectacular, 70 ft. falls is located in an old-growth forest. The lower approach to the falls is a walk on a gently sloped trail to its base. The hike is markedly changed from years past; though the hemlocks in the area are dead, you'll travel through an otherwise beautiful woodland and discover pleasant forest scenes along the way. Enjoy the falls from in front and from behind! The drive to the falls is an experience of its own, and along the way you'll pass many more scenic and interesting features. Note: The final stretch of road (FS 74) to the parking area is closed and gated in winter (usually starting in late December thru March), and possibly other times of the year due to weather. Call ahead to the Forest Service office to find out if it's open before you go! From Asheville, take US 19-23 north/Future I-26 West for about 11 miles. Take Exit 15 for Jupiter/Barnardsville (NC 197). Turn right toward Barnardsville and follow NC 197 (2-lane highway) about 6 miles to the town of Barnardsville. Turn right onto Dillingham Road just past the fire station. From that junction, it's about 6 miles to the National Forest - stay on Dillingham Road the entire way (bearing left at Dillingham Presbyterian Church and Stoney Fork Road, and then right just past a one-lane bridge at Town Branch Road). Past the horse farms, bear left at Walker Creek Road and cross the one-lane bridge; the road will turn into gravel FS 74 with a National Forest sign for Big Ivy just beyond. Follow this gravel road for 8.7 miles until it ends in a parking lot. The trail starts at far end of the lot as you drive in. Start by taking the Douglas Falls trail at the back of the parking lot, which may be signed (if it is not vandalized, like all trail signs you encounter have the potential to be). 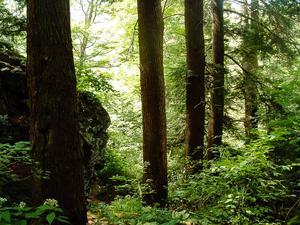 The very popular trail is well-used, short, and slopes gently downhill all the way to the falls. From that perspective, it is easy. 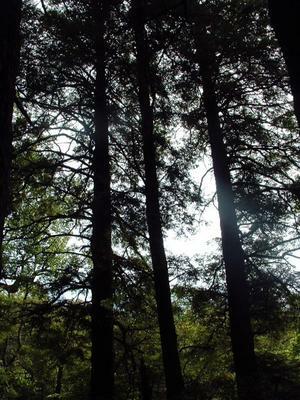 A former row of large Hemlock trees near Douglas Falls. These are now all dead. 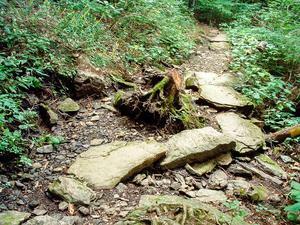 However, the trail's surface condition has varied greatly over the last few years. From the mid 90's to the mid 2000's, it was in decent shape. Then, the trail got some needed repair work. Improvements were made in some of the rougher spots, making it in excellent condition. It stayed that way for a year or two. 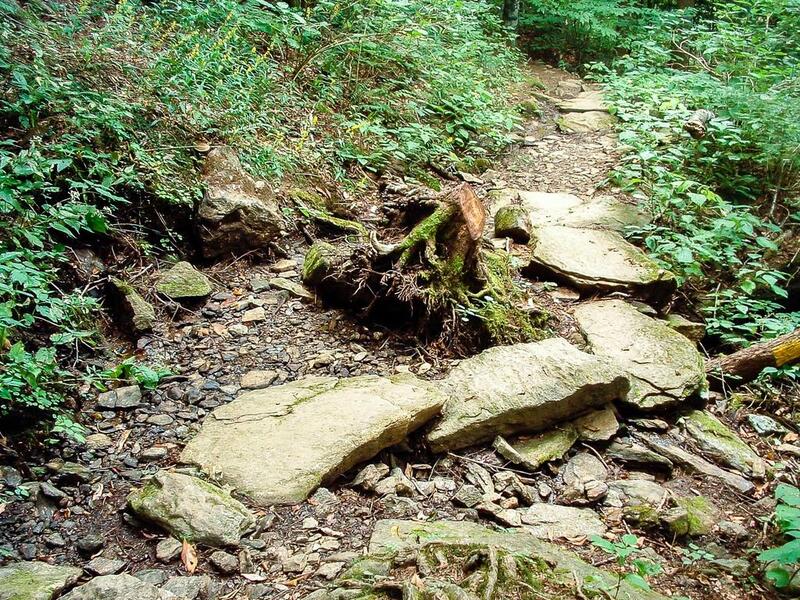 But over the next couple of years, fierce storms took their toll on this trail. Some sections of the trail started having drainage problems, making it muddier and wetter than it should be. Several big trees fell onto the trail, making difficult climb-arounds necessary. The trail was in poor condition for a while before many of these problems were fixed, and it was in good shape again. Recently, a fallen tree took out a section of the trail with it. But for this one location -where the hiker is forced to traverse a wet, sloped rock area which is downright treacherous - the trail is still in good shape. All this is to say, trail conditions can vary greatly, and rapidly here. For this reason, and with all the dead hemlocks about to start falling on the trail, I've upped the difficulty of this hike to "moderate". It had originally been "easy". The forest near the beginning of the trail was once logged, but has recovered nicely. 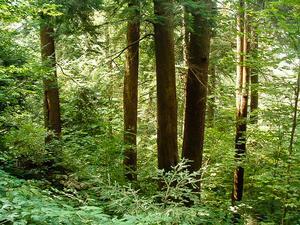 Medium-sized oaks, maples, beeches and hickories make up this mixed hardwood forest. This area is prone to wind; hike here in the winter on a windy day and the trees will be swaying and howling as the air rushes through. 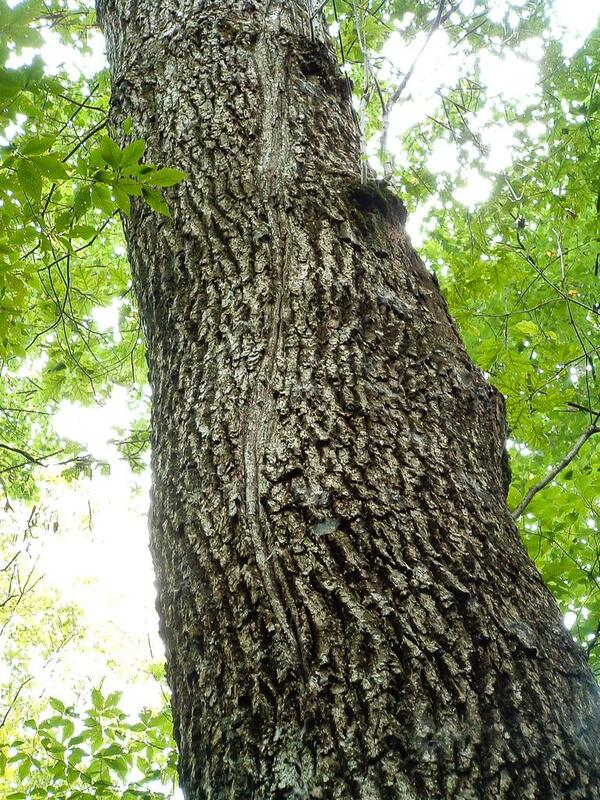 It's a good idea to beware of loose or broken timber above you (called "widow makers") on days such as that. 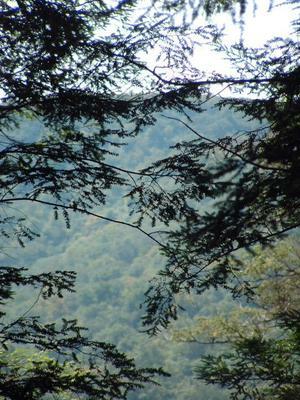 Most times, however, the hike is pleasant with the faint sound of a stream rushing far in the valley below. Douglas Falls in late summer - a day before the remnants of Hurricane Frances (2004) blew through, bringing massive flooding to the region and taking its own toll on this trail. 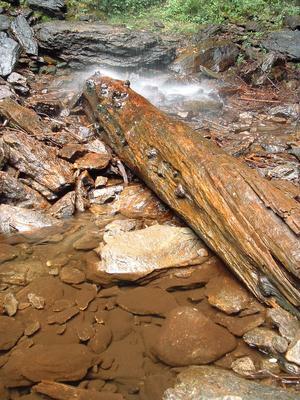 About 2/3 of the way to the falls, the trail gets a bit wetter as several seeps cross the trail from the hillside above. Well-placed stepping stones help you get through some of them with dry feet. 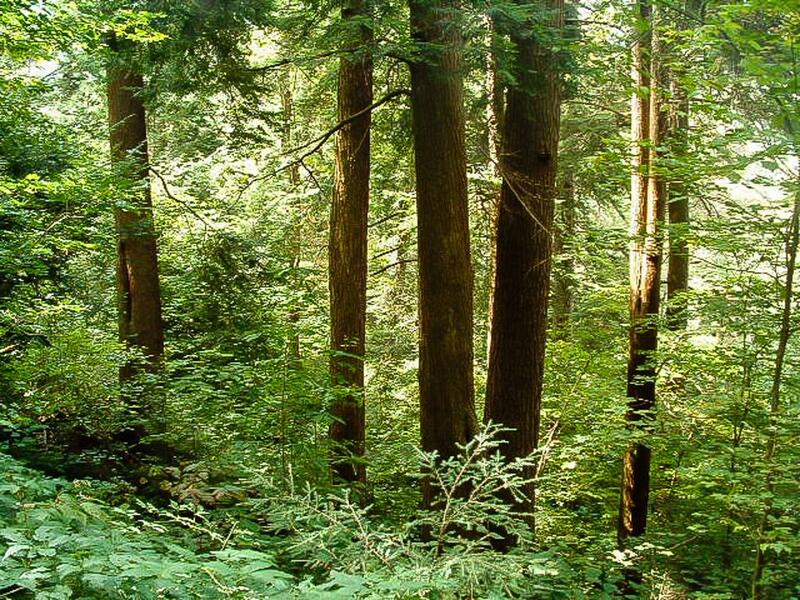 And in times past, you also noticed a sudden and dramatic change in the forest at this 2/3 point, as it became dominated by tall, dark hemlock trees looming over whatever understory could survive in this "deep, dark forest". That's what my parents would call it (with an air of doom and drama in their voices), hiking here when I was growing up to get a rise out of us kids. But it was actually pretty true, and even the little ones would have noticed it. As of July 2006, the hemlocks at Douglas Falls had been infested with the Hemlock Woolly Adelgid for a couple of seasons, but they were looking remarkably healthy and putting on plenty of new growth in the area around and above the falls. This could have coincided with a predator beetle release in the area that was used to fight the adelgids. That was to be the last sign of new growth, though - a worsening infestation combined with the record-breaking, excruciating drought of 2007 thru early 2009 did them in. 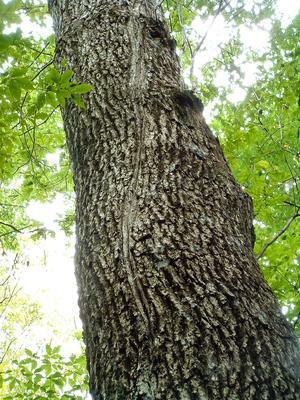 As of June 2009, virtually no new growth was occurring, even on the smaller trees, and most of the largest trees were completely dead. A few young ones still looked pretty green, but whatever treatments (including beetle releases) the forest service had done in this area were clearly an epic failure. 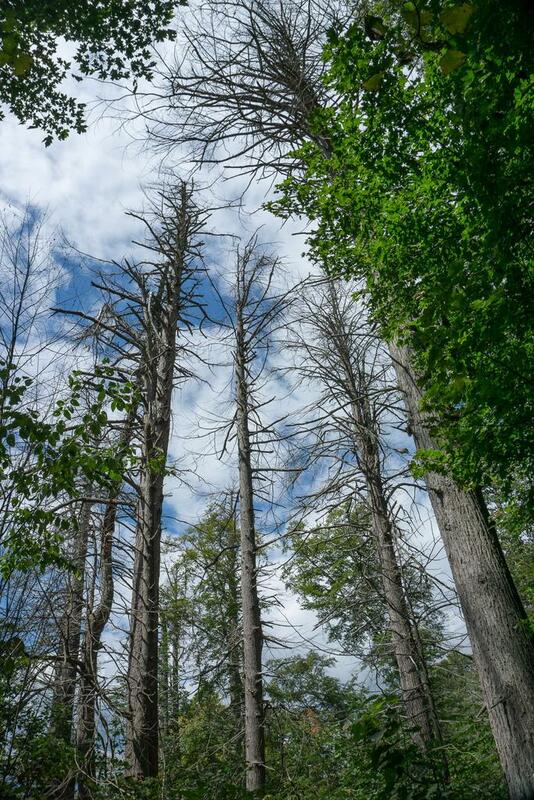 As of July 2013, there were very few signs of life in any hemlocks along the entire trail. Strangely, however, there was at least one small hemlock (a Carolina Hemlock) near the parking area that showed no signs of infestation at all and was growing vigorously. As of 2017, the larger hemlocks are falling down, yet a few small ones miraculously cling to life. 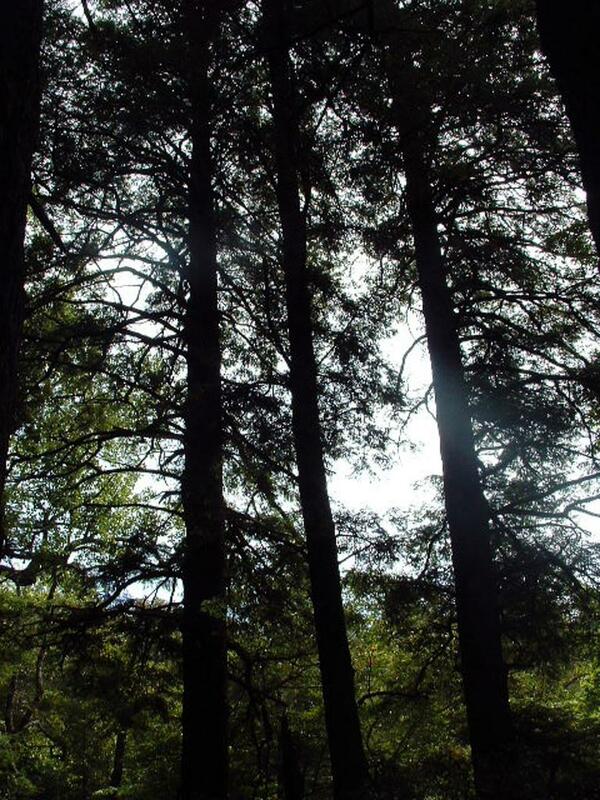 It appears the Carolina hemlocks are less affected by Hemlock Wooly Adelgid, so maybe they stand a chance. 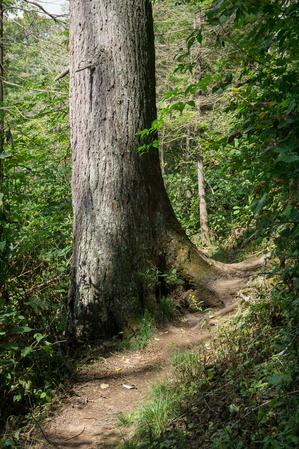 Loss of the hemlocks is letting in a lot more light than ever before along the trail, and in all likelihood - once the hemlocks have fallen and decayed - the trail will eventually have a more homogeneous character from beginning to end, besides getting wetter near the falls. 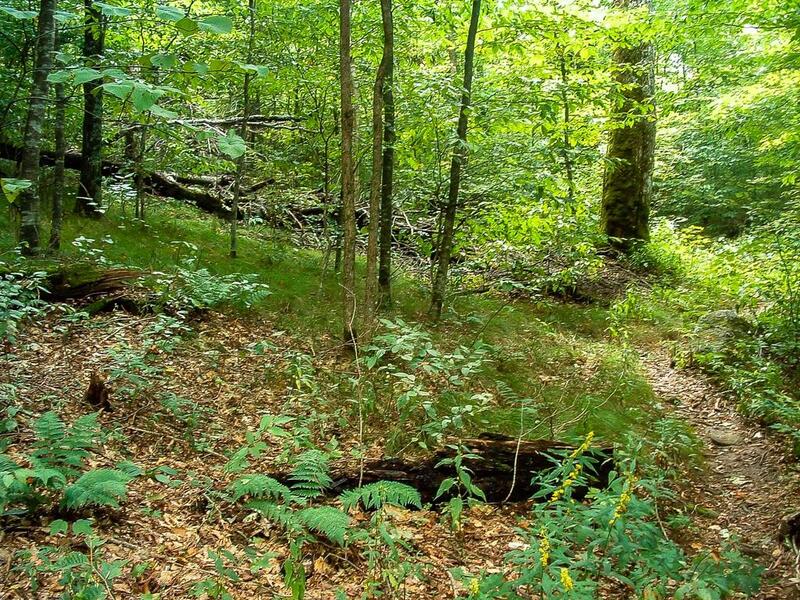 At that 2/3 point, you enter a virgin forest - one that has never been logged - albeit one vastly different from its ancient self due to the loss of the hemlocks. Still, some of the deciduous trees here are enormous as well. 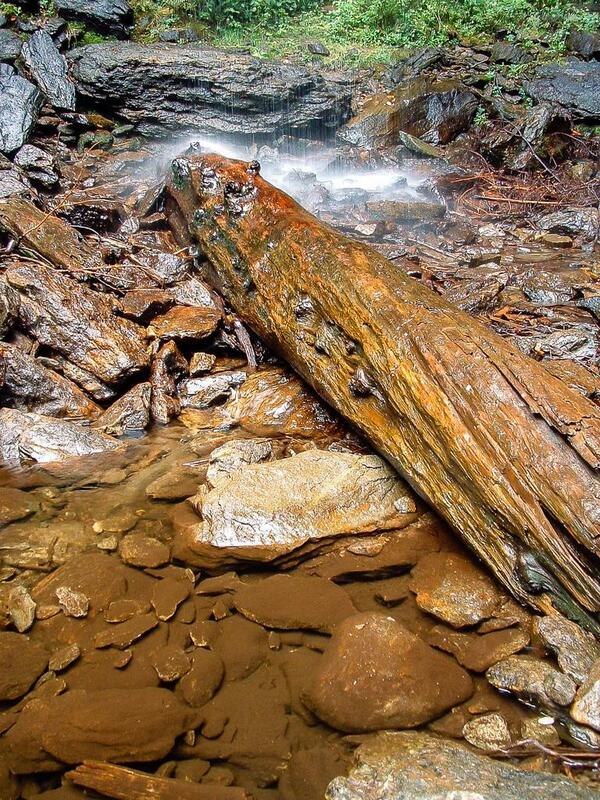 This old hemlock log has been lying here directly underneath Douglas Falls since my first memories of this hike in the late 80's. You'll see the falls shortly after entering the zone of dead hemlocks. Luckily, perhaps, the area directly around the falls had already lost most of its hemlocks due to wind and old age in the 80's and 90's. 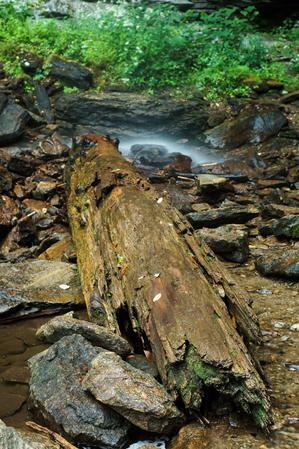 One such log has been laying in the pool at the base of the falls getting pounded by the falling water for at least 20 years. So once you arrive at the falls, the impact will be much less obvious. Enjoy exploring around the base of the falls. You can even easily and relatively safely walk behind the falls if you don't mind getting dripped on a bit. But be careful on the slippery rocks which lie all around the base! There is no safe way to get to the top of the falls. Just before arriving at the falls, the trail veers left, uphill. It winds up in the cove far above the top of Douglas Falls, and eventually ends up at the Craggy Gardens Visitor Center on the Blue Ridge Parkway. 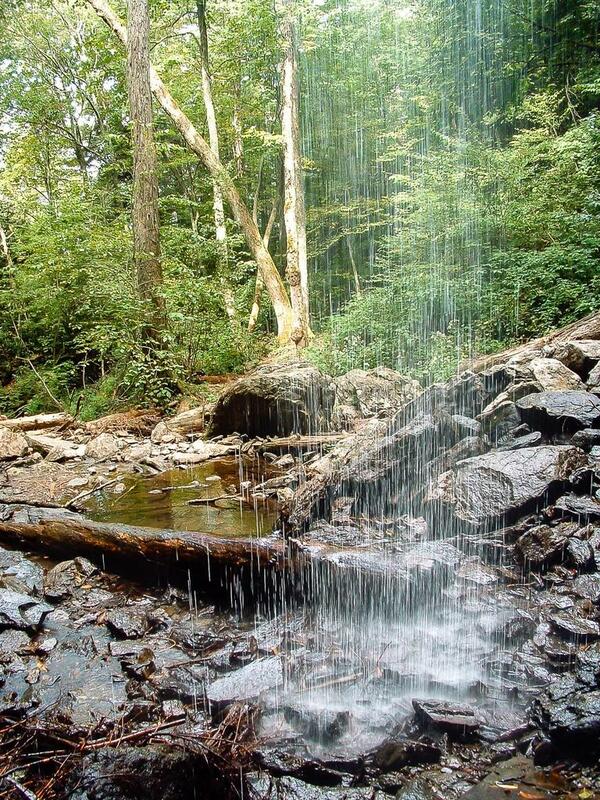 The trail crosses one other waterfall, Cascades Falls, on the way. 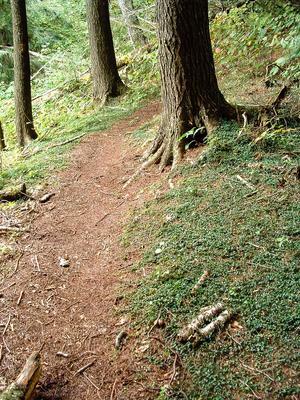 However, that is a long, strenuous hike through a proposed wilderness area, and the trail is sometimes difficult to follow. 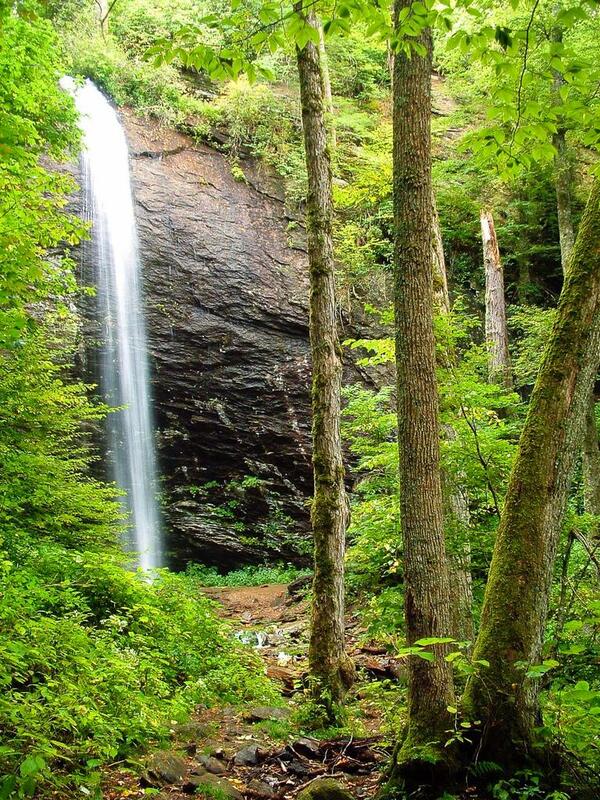 If you're looking for a bigger adventure, some people do choose to visit Douglas Falls by hiking down from the Craggy Gardens area. When you're finished soaking up the scenery and/or soaking your feet in the cold, clear water, return to your vehicle on the same path. William said: Thanks, but, the driving directions aren't very good. Followed them to a tee and didn't end up at the falls. The road splits with no sign and it's a 50/50 guess which direction to go. Keeping with my long history of bad luck, I went left, which seemed to be the main road, when in fact, you have to turn onto a completely different road that is actually still Dillingham. Beth Bradshaw said: Just a word of warning, call the forest service before you go if you're hiking off-season. I just tried to go yesterday and FS 74-A was gated and locked about a .5 mile from the point where the road turns to gravel. Rose said: Karen, the "campground" is not really a campground. There are many small campsites scattered along the way up the mountain. None of them are too close to each other so it is extremely secluded. its beautiful there and is a great place to camp as long as your ok with the primitive camping. It is well worth it and as the article says, even the drive up the mountain is worth the experience. Once you have gone a couple miles up you will start to see the little sites off the sides of the road. some are a little further back( I like those). Good luck, and hope you enjoy. 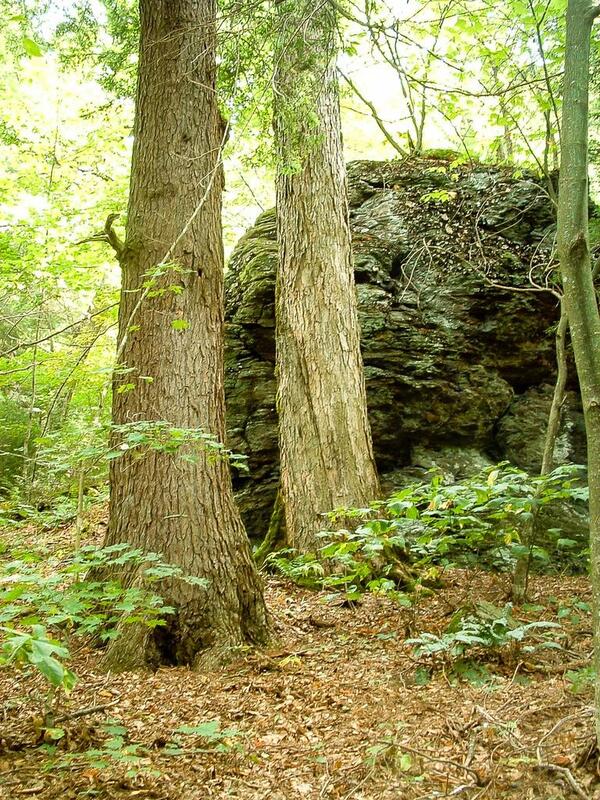 Bridget said: I have hiked and camped here on several occasions- it is so wonderful to camp there- you feel like you are alone in the woods and its relatively unknown so not many people are bothering you. The hike to the falls is beautiful- if you want a great trip where you can really collect yourself- this is it. 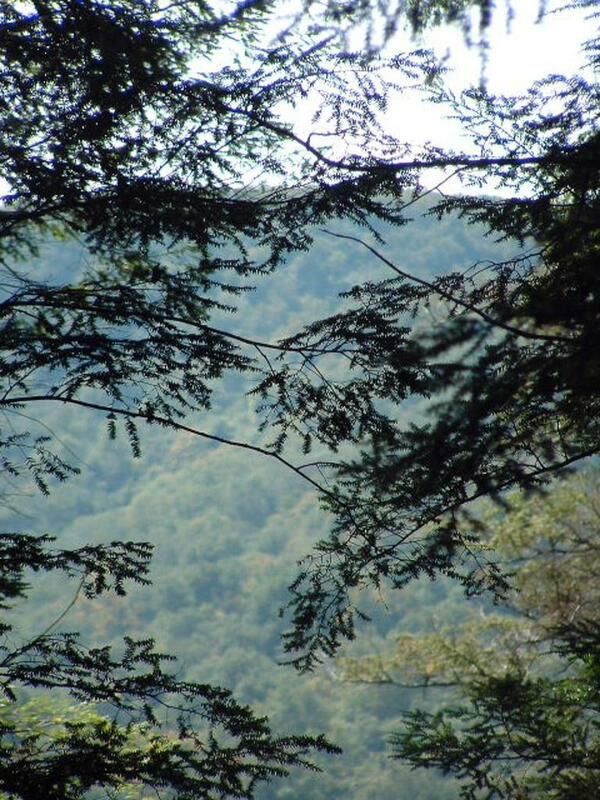 Karen said: I see the photo that says above the campgrounds. I'm hoping someone can tell me something about that. I'd like to take the family there to camp, hike and explore the waterfalls. David Braverman said: Nice hike. Short, easy and a very nice waterfall with cave at the end. Perfect spot for an overnight.